There’s nothing wrong with being outdone by yourself. After last month’s Shop Talk, wherein we proposed we had found the ultimate luxury vacation villa, we couldn’t help but admit that a few weeks later we’d found something even better. 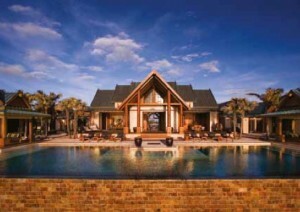 Nandana is a newly completed luxury estate directly on the sea at the far West End of Grand Bahama Island. It’s set within an exclusive gated enclave that offers the ultimate in privacy and luxury. The name of the estate means “paradise” in ancient Sanskrit, and we couldn’t agree more. It’s a fully staffed island home designed for intimate gatherings of up to 10 family members or friends. 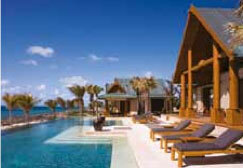 firm in an Asian beach house style, the property comprises six separate buildings. A spectacular main house with soaring 40-foot ceilings is surrounded by five richly appointed and free- standing bedroom suites. The interior of the property has been constructed entirely from natural materials with massive amounts of imported Burmese teak covering the floors, walls, and ceilings, and natural stone forming most other surfaces. A professionally designed lighting system has been installed to emphasize the property’s many distinctive architectural features. The buildings are centered around a 120-foot infinity pool with waterfall edge, dropping to a private sandy beach below. A separate large outdoor Jacuzzi overlooks the beach, and the compound is shaded by more than 300 imported palm trees and tropical plants. The property is bounded in the front by the ocean with a protected sandy beach and in the rear by a deep water canal with private docking facilities for yachts up to 115 feet. The main building contains the primary socializing areas including living room, dining room, kitchen, bar, and glass- enclosed wine room. Standing either side of the main building and directly on the beach are two large one-bedroom Pavilion suites. Each measures in excess of 1,000 square feet and contains luxury bathrooms with a Jacuzzi, indoor/outdoor shower, walk- in closet, writing desk, mini bar and private sundeck overlooking the sea. A few steps back from the beach, amid gardens of palms and tropical greenery are two one-bedroom Bangala (bungalow) suites. Each suite boasts more than 750 square feet of space with a bedroom, sitting area, bath with indoor/outdoor shower, writing desk and mini-bar. Along the canal rises a 2,000-square- foot luxury air-conditioned safari tent with separate bedroom, bath, and living area. The furnished tent contains the same TV, and wireless Internet services as the Pavilions and Bangalas.